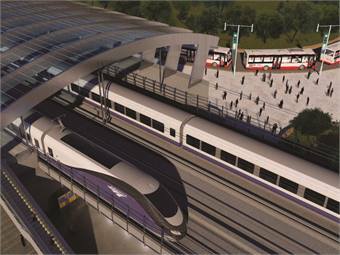 There is no doubt that the development of HSR requires massive investment. Take as one example Amtrak’s September 2010 publication, “A Vision for High-Speed Rail in the Northeast Corridor.” Amtrak outlined plans for a partly brand new and partly re-engineered, 426-mile, Northeast Corridor running from Boston to Washington, D.C., introducing true high-speed rail in the Northeast Corridor. The document has projected construction costs estimated by Amtrak at $117 billion in 2010 dollars.4 Like many other routes being proposed, calculating the financial impact using a standard “farebox” model will lead to the inevitable conclusion that it is not financially viable. There is, however, a financial calculus that is generally overlooked. This includes the pressure that HSR can take away from existing infrastructures. For example, where urban road systems are concerned, there are a number of key factors that can be heavily influenced by a robust HSR network. Modal shifting from automobiles to HSR reduces congestion on capacity-constrained road networks. This results in reduced transit times from home to work, which improves productivity by freeing people who might otherwise spend up to two hours a day commuting. Shrinking the number of automobiles on the road network also cuts carbon emissions and saves fuel. All of these attributes have a definable, measurable economic value to society and they need to be factored into the business case for HSR. As things stand, current models give only a limited understanding of the value proposition for HSR, with an emphasis placed on the upfront costs of these projects — and less on the wider impact they may have. Because a traditional economic model is still being applied, relying predominantly on fare-box revenues to cover both operating and capital costs, many of these projects risk being doomed from the start. An “out of the farebox” approach needs to be applied. A “New Calculus” needs to be created to recast the economic value proposition more holistically. The numbers in this example are illustrative only. But, one can see from the basic numbers in this example that EVA contribution goes from a net loss of $42 per passenger trip to a positive contribution of $173, when these wider issues are factored into the economic decision. This calculation puts a dollar value on all of the factors when considering the cost of taking a traveler from the car and putting them on the train, not just the sale of the ticket. We need to consider this EVA model approach to help politicians, the public, and, crucially, private sector investors to get a complete view of HSR. Only then can decision-makers see the final economic impact of HSR. They can then decide if it should be incorporated into plans for a coordinated and linked intermodal strategy that leverages limited funds to maximum effect. The key is getting people to look at HSR through a different lens. It can help us better understand if HSR projects can help our economy remain competitive, protect our environment and ease pressure on overloaded, and increasingly outdated, transportation infrastructures. This means going beyond the restrictive thinking of the past and toward the wider impact of an HSR investment. Many are aware of the transportation challenges in the U.S. and elsewhere. From infrastructure deterioration to investment requirements, from congestion to rising fuel costs and from growing carbon emissions to lost productivity, the scale of these challenges should not be underestimated.